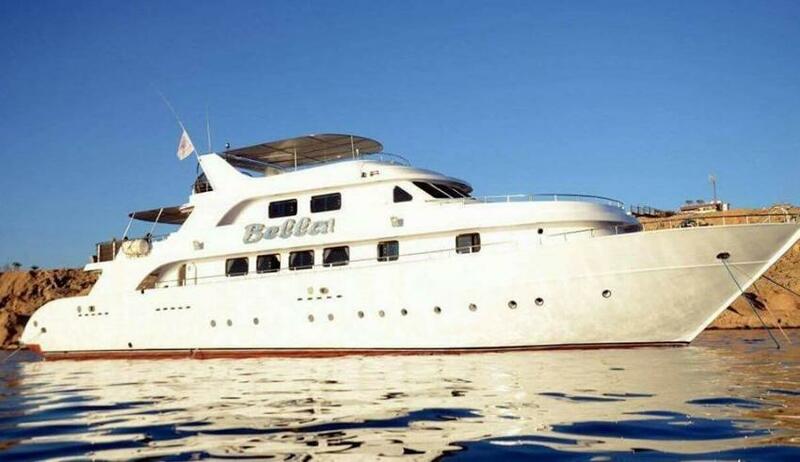 Bella a modern build vessel, offers diving at wrecks of the North Red Sea and Southern dive sites. She offers comfortable accommodation combined with excellent diving facilities and smart price. The boat has a shaded sun deck, large salon area that is great to spend time after diving. Yacht catering to 20 guests. There are 8 cabins with twin beds, 1 double bed stateroom and one master suite with a king size bed. All cabins are air-conditioned and have private bathrooms. Big boat's salon is perfect to spend time in between or after dives. It has an entertainment area, a library, and comfortables sofas. Also, boat’s guests can relax at sun deck on cushioned beds. Safety is always important. Bella’s crew team trained to manage emergency situations. There are emergency rafts and life jackets, first aid kits. Also boat supplied with radar, depth sounder, GPS, bilge pump alarm, searchlight. On board of Bella liveaboard you will be able to explore Abu Nuhas Reef with its wrecks, Ghiannis D, Carnatic, Chrisoula K and Kimon M. But also diving itineraries features Ulysses, Rosalie Moller, Kingston and one of the most famous Thistlegorm. Best time to go to Egypt in Spring and Autumn. Warm comfortable water temperature from the end of April is great to dive at Red See. September through October is also great to explore Egyptian dive suites. Summer can be rather hot, there are fewer opportunities to see big creatures.